Were the energy shocks of the 1970s engineered by an effective cartel acting to share the market by controlling output and influencing oil prices? If OPEC was an effective cartel sharing the market among its members, there would be a long run relationship between each member's production and total OPEC output. One would also expect OPECs production to significantly affect the price of oil. These implications of cartel behavior are tested via cointegration and causality tests. The likely effects of regime changes are dealt with using techniques developed by Perron (1989). There is evidence of output coordination among members of the organization, especially in the output rationing era (1982-1993). This is also the only period in which the causality from OPEC production to the price of oil is statistically significant. 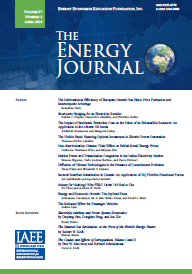 Published in Volume17, Number 2 of The Quarterly Journal of the IAEE's Energy Economics Education Foundation.